Flex pans are used to make our flex pan window awnings. There are, however, a few other uses for these wonderful shade givers. If you can find a way to mount the stringers you can use flex pans to give an attractive shade for just about anything. In many cases extra support posts can be added. The stringers can then be attached with brackets and arms or laying flat on the post. In Arizona we install a lot of flex pan sunshields like the one pictured. 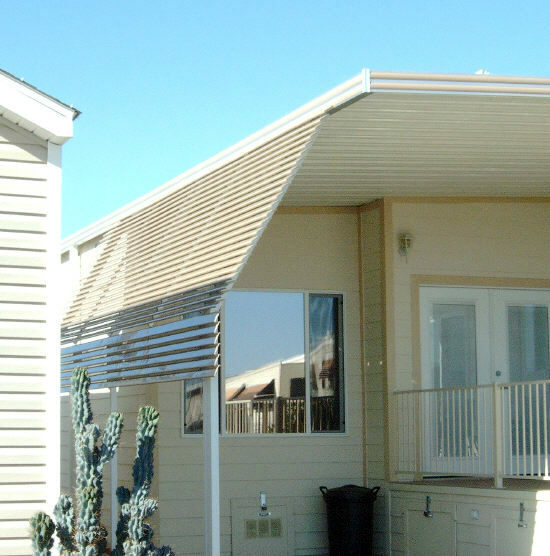 Using the posts of an existing awning it is easy to install flex pans in this fashion. Used in this way the sunshield provides a lot of extra protection for your vehicles or patio furniture. When a little more support is needed we add I-beams, screen room 2x2 or a 1 1/2" LS tube where necessary. It is very easy to get creative with this type of shade. Flex pans can be adapted to just about any situation. The color selection is great also. We can match or compliment just about any color you may have. The louvered design makes this type of shade very wind resistant. We find very few of these damaged by strong winds. The pans snap into place very tightly and the wind is allowed to blow through. 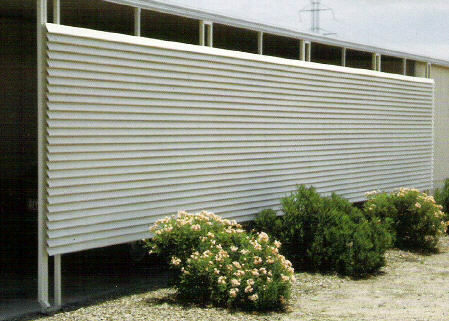 The Atlantic, or sometimes called Aurrora, window awning uses flex pans also. The standard flex pan window awning has no sides. This concept was designed to add even more shade. This is very similar to the traditional style canvas window awning. This product is aluminum with a baked on enamel finish and will outlast it's canvas counterpart by many years. These are a few of the many uses of flex pans. 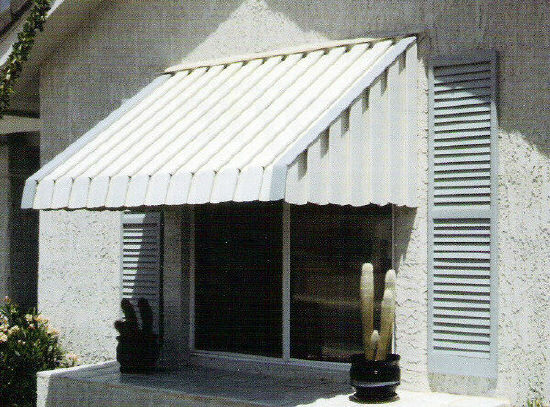 This type of awning is sold in do-it-yourself kits. You can find flex pan prices here. You may use my contact form for installed quotes on flex pan privacy panels or any other shade needs in the Mesa, Arizona area. Or give me a call, I would be happy to work with you.